The first meeting of the new panel was on 29th October. Please contact us if you would like to read the report of the meeting. On 30th October 2017, Nicola, a PRERA committee member, attended an induction to the Area Board – a new consultative body that is being set up by the council. The Area Board is to replace the previous structures that were in place for consulting residents of council housing estates. Nicola has kindly volunteered to be our nominated representative on the Area Board. 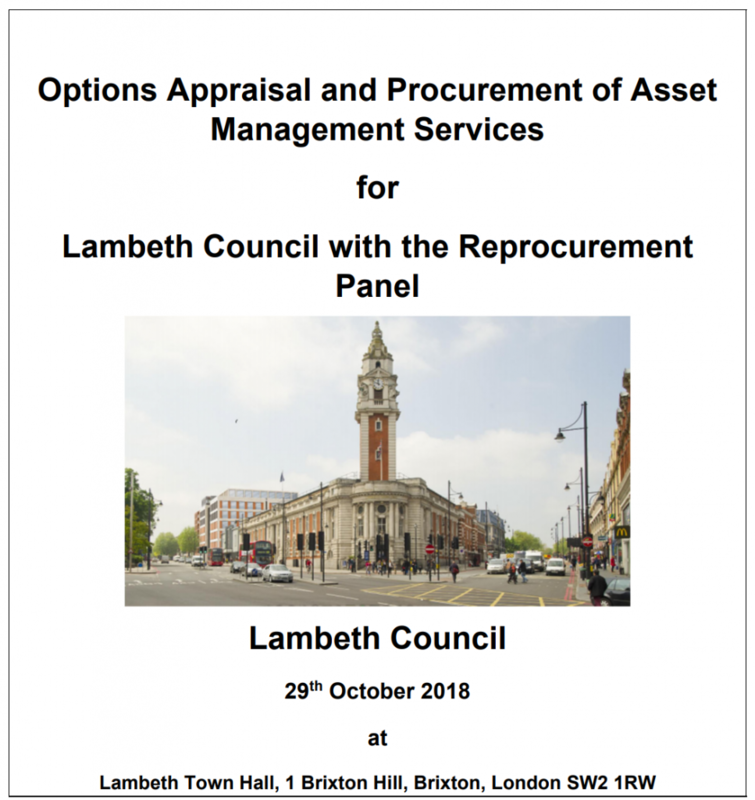 Nicola reports that the Area Board is intended to allow residents and tenants to review Lambeth council’s performance across a number of areas. If it achieves this, and can bring about much needed improvements, then the Area Board should be worthwhile. A Q&A document about the new Area Boards. A description of the role of an Area Board Member. The draft terms of reference for the Area Boards. Plans are under way to build a new resource centre for adults with learning disabilities on Coburg Crescent. Contracts representative, Michelle Baker, attended a meeting about this on 15th January, where she met council officers, the architects and other stakeholders. Future workshops are to be arranged to discuss designs. 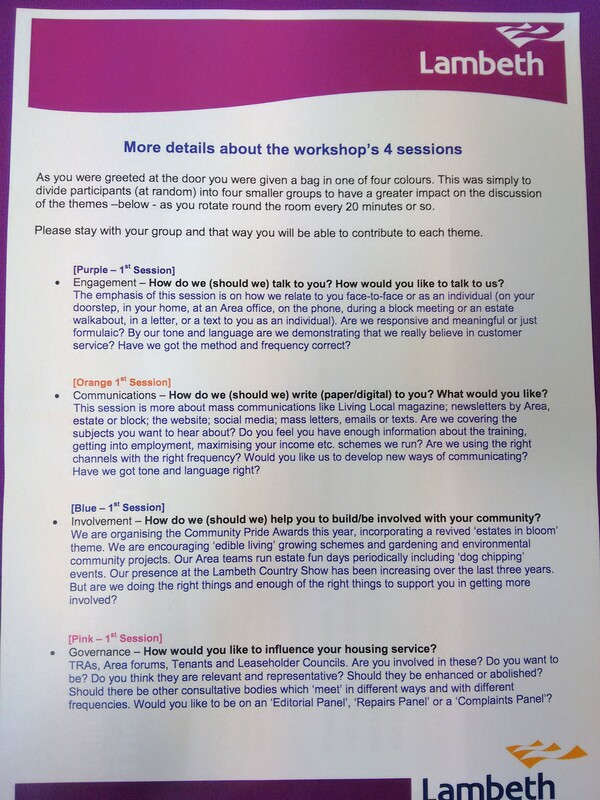 The workshops will cover four areas: day services, employment, accommodation and community. PRERA will represent the residents’ interests at the community workshop. Plans are expected to be submitted to the planning authorities by the end of May. Work on the new building will potentially start at the end of 2016 and will take approximately one year. Some notes that were handed out at the meeting can be downloaded here. 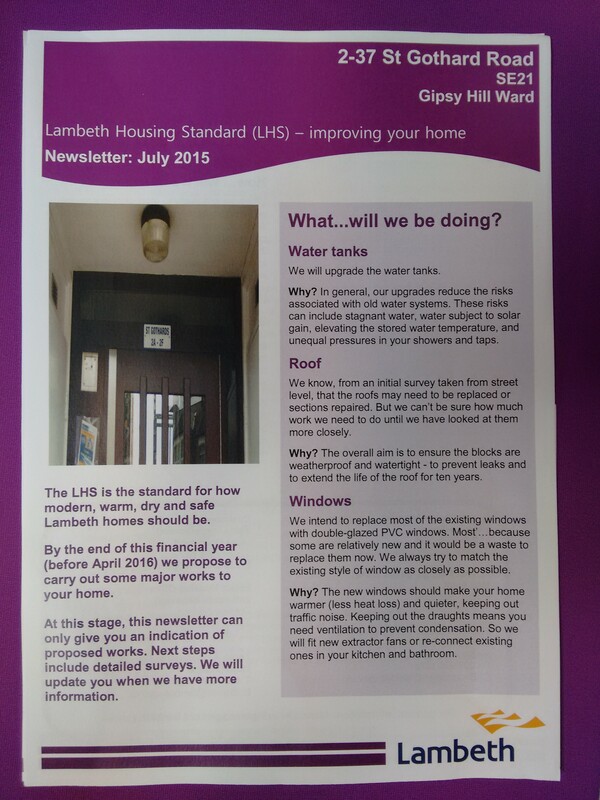 Claudette Amarteifio and Robert Johnstone attended a Lambeth council resident engagement workshop on 11th July 2015. 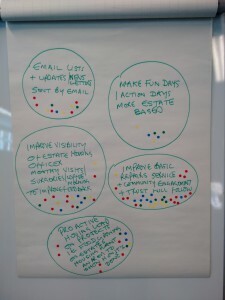 It was introduced by Matthew Bennett (Cabinet Member for Housing) who pointed out the low level of satisfaction that residents currently have with their ‘engagement’ with Lambeth Living (<40%) and the low level of awareness of the various forums that exist (~30%). He said that a report would be written based on the workshop and presented to the cabinet in September. The photo below is the programme for the day. 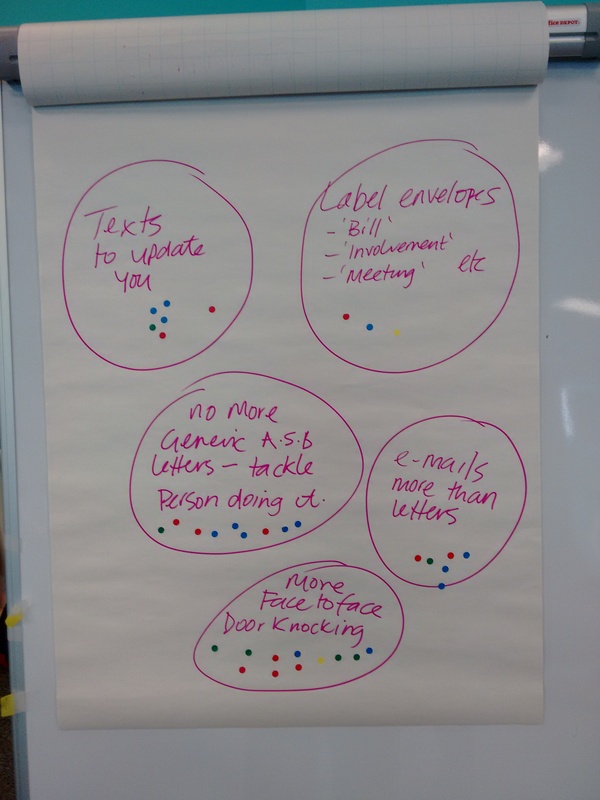 We sat on four tables and discussed four topics in sequence with the facilitators rotating. 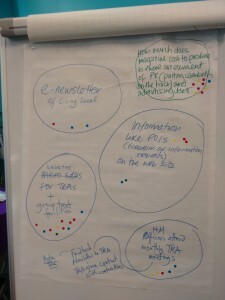 The facilitators were Tim Fairhurst (North Area Housing Manager), Marek Effendowicz (Head of Communications), Linda Elliott (Estate Pride Project Manager) and Mark Howarth (Governance and Resident Participation Manager). Neil Whiteman (new Director of Housing Management for Lambeth) and Matthew Bennett floated around, listening in. The second photo (below) is a prototype for a new type of leaflet that was presented by Marek Effendowicz. He proposed that such a leaflet (a single A4 page) be delivered on three occasions for any major work – before, during and after. 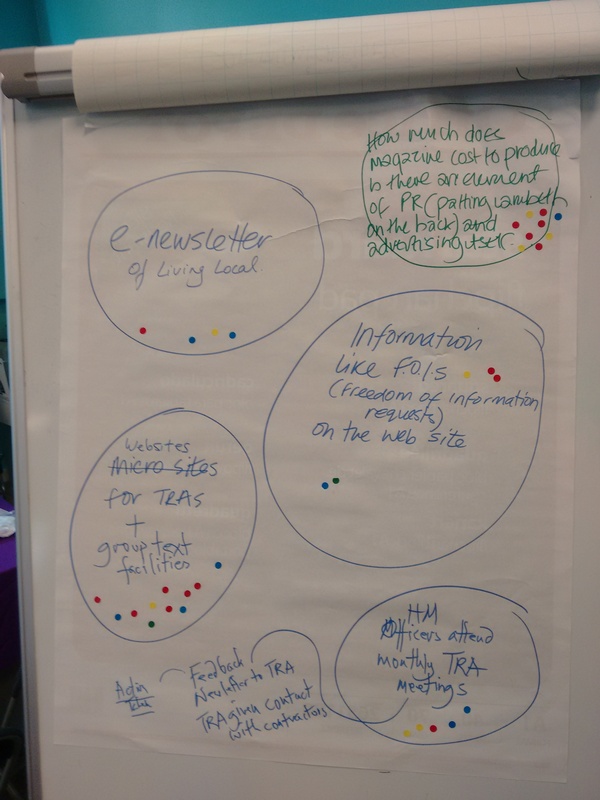 This idea had a good reception at the meeting, with most people finding the quarterly LivingLocal magazine too general to be of interest. 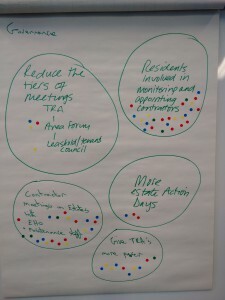 The remaining photos show some flip-charts that were completed by the facilitators to summarise the suggestions made on their topic. 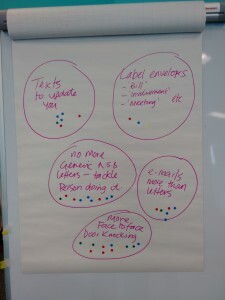 Participants were each given six stickers that they could use to highlight what they considered a priority. “This was the first time that I had attended one of these meetings. They are an opportunity for residents’ representatives, council estate services (caretaking) officers and contractors to meet. 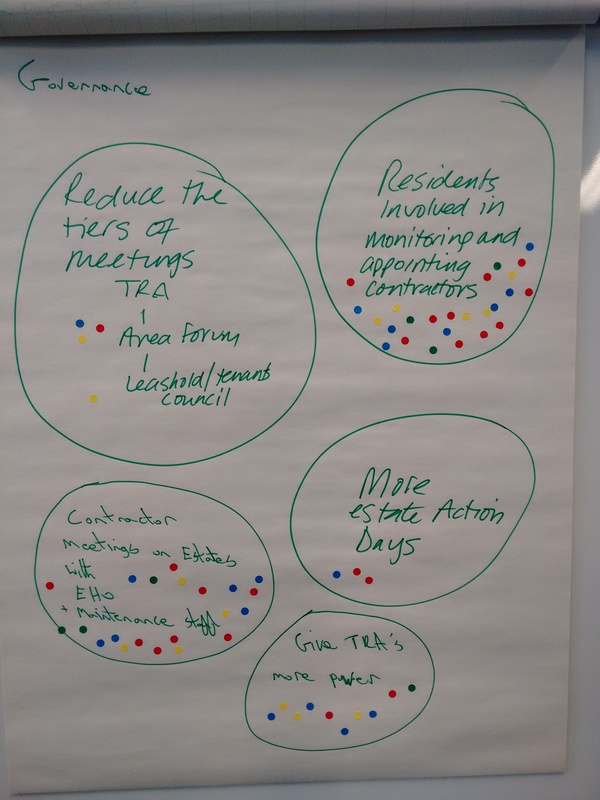 Today’s meeting was attended by four tenants’ and residents’ association (TRA) representatives, three estate services housing officers and representatives from Pinnacle and Keepmoat – the cleaning and grounds maintenance contractors. The chair was Omar McDermott, the estate service assistant manager. The three groups (residents, officers and contractors) each took their turn giving reports to the meeting. 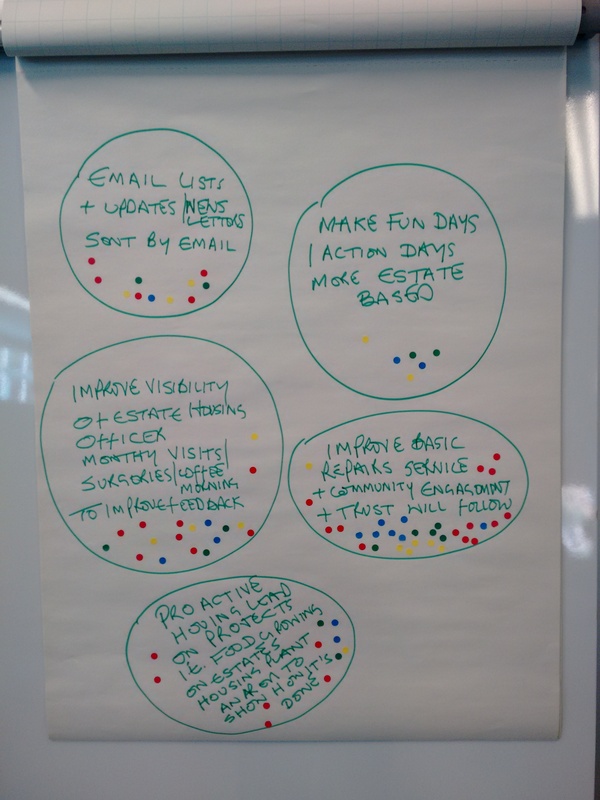 I found the meeting refreshingly positive, with everyone seeking to work together towards improving the environment of the south Lambeth estates. These meetings recently changed from being monthly to quarterly, so the next meeting will be on 16th March 2016.